It’s really hard for me to share this dish with my family. I want it all for myself. The trick to making this diss is getting your cauliflower slightly crispy. No one likes soggy veggies. It took me a few tries, but I finally figured out the formula! The secret to perfectly crispy roasted cauliflower revealed! Break down your cauliflower head into really small pieces. The cauliflower will cook quicker AND there will be plenty of crispy bits for all. Don’t crowd your cauliflower. Spread the cauliflower pieces out. They’ll sweat and become soggy if pack them too closely on one baking pan. 1/3 cup of chopped roasted almonds. Can be chopped in a food processor. Whisk together the cumin, 1/4 cup of the olive oil and 1/4 tsp salt. Brush the cauliflower with the cumin mixture. Bake in oven for approximately 25 minutes or until the cauliflower turn golden brown. In a bowl with a whisk, mix together the tahini, yogurt, lemon juice, honey, 1/4 cup of olive oil and 1/4 tsp of salt. Set aside. 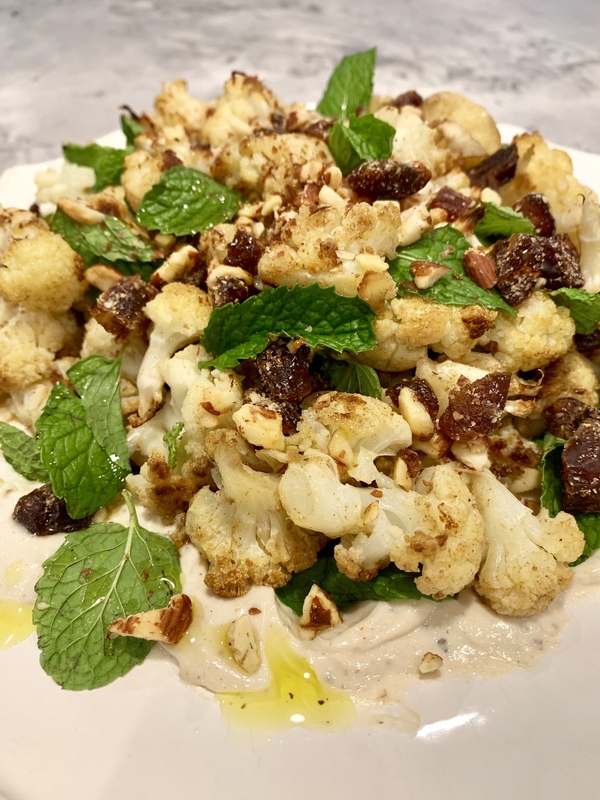 Before serving, in a bowl combine the cauliflower, almond/date mixture and the mint leaves. Plate the cauliflower mixture over the tahini/yogurt and serve!